NOTE: This article has been corrrected. At last week’s Conservative Political Action Conference, Minnesota Gov. Tim Pawlenty called on the attendees to imitate the wife of Tiger Woods: "We should take a page out of her playbook and take a nine iron and smash the window out of big government in this country." But there’s a problem for Pawlenty and the activists who cheered him: Rank-and-file conservatives actually like big government. As the graph above illustrates, the respondents who identified themselves as "conservative" or "extremely conservative" had little appetite for specific spending cuts. 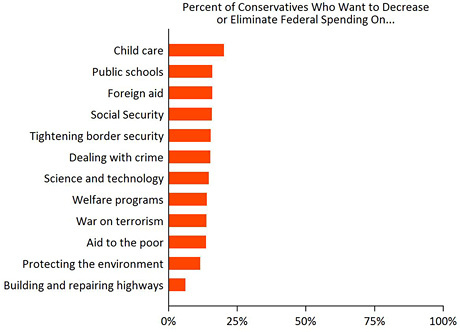 Very few conservatives said they favored reducing (or cutting out altogether) spending on any program. The least popular program proved to be childcare -- with a grand total of 20 percent of conservatives saying they’d slash it. The most popular is highways; only 6 percent want to cut spending there. Even bugaboos like welfare and foreign aid fare well, attracting the ire of only 15 percent of conservatives. Amazingly, the survey found that, on average, 54 percent of them actually wanted to increase spending. Political scientist James Stimson has suggested that a fifth of the country consists of what he calls "conflicted conservatives," those who might respond positively to a broad appeal like Pawlenty’s, but not once specific windows start getting smashed. At CPAC, Glenn Beck turned to 12-step lingo: "Hello, my name is the Republican Party and I have a problem! I’m addicted to spending and big government." But why blame the GOP? After all, the party is being enabled by its own base. John Sides is a professor in the Department of Political Science at George Washington University. He blogs at the Monkey Cage (http://www.themonkeycage.org/). Correction : The data in the above graph is based on a report from the American National Election Study that was later corrected. The percentages for each category are not accurate. ANES subsequently published an erratum, which can be viewed here. A corrected graph can be found here. Foreign aid and welfare are more unpopular among conservatives than the original graph suggested. About 50% of conservatives want to cut or eliminate foreign aid and 35% feel similarly about welfare. From Sides : The broader point does not change: for most programs, the percentage of conservatives who want to cut spending is small. In fact, it's striking that even foreign aid and welfare attract as much support as they do, especially given the long history of conservative opposition to these programs. The fraction of conservatives who want to increase spending -- an average of 54% -- is unchanged. The disjuncture between the views of activists and rank-and-file conservatives remains.